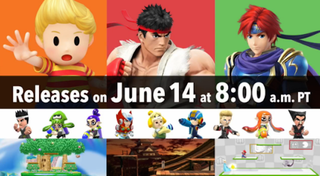 Nintendo just released a ton of mostly paid downloadable content for Smash Bros. on Wii U and 3DS. Here’s what it’ll cost you, if you’re enticed. And, finally, the very elaborately-designed Ryu from Street Fighter, who if you saw the Nintendo Direct, has a very distinct control scheme with lots of interesting uses of his classic combo moves and inputs. Plus a stage!